Britain’s relationship with the rest of the world, our foreign policy, is no longer sustainable. We’re entering a new, fast-changing and more dangerous world, including the reckless attacks in Salisbury, which the evidence painstakingly assembled by the police points to the Russian state. When president Trump takes the US out of the Paris accord and tries to scrap the Iran nuclear deal, moves the US embassy to Jerusalem and pursues an aggressive nationalism and trade wars, then he’s turning his back on international cooperation and even international law. We need a government in Britain that not only keeps the country safe, but can also speak out, speak out for democratic values and human rights. Today’s Conservative government continues to collude with the disastrous Saudi-led war in Yemen, turning a blind eye to the evidence of war crimes on the devastating suffering of millions of civilians. That’s why I was honoured to attend a vigil this week held in Liverpool by the Yemeni community in protest against what is taking place. Labour’s foreign policy will be driven by progressive values and international solidarity, led by our international team of Emily Thornberry, Kate Osselmore and Neil Griffith. This means no more reckless wars of intervention after Iraq or Libya, it means putting negotiation before confrontation, diplomacy before tub-thumping threats. And it means championing human rights and democracy everywhere, not just where it’s commercially convenient. And working to resolve the world’s injustices, not standing idly by, or worse, fueling them in the first place. He’s also applauded during this section, which is the end of the part of his speech included in the video. Dimmack then goes on to the make the point that Corbyn was absolutely correct when he said that the UK’s foreign policy was unsustainable. It is, That’s why we’re in all these wars in the Middle East. Because it’s all about the oil, the petrodollar and a natural gas pipeline that has to go through Syria to supply Europe. And in answer to those, who deny this, the value of the world’s reserve fund is based upon it. And it isn’t sustainable, because oil and gas, fossil fuels, are the very products leading to the destruction of this planet. He argues that we have to move away from these wars in countries we shouldn’t be involved in and take care of our own country. He is critical of Corbyn’s comment about the evidence in the Skripal poisoning pointing to the Russian state. This has ruined his speech for Dimmack, but he believes Corbyn has to say it, as if he didn’t, that would be the headlines in the paper the next day. Dimmack liked the fact that Corbyn called out Trump, and pointed out that you don’t get Tweezer calling out Trump. You get them sycophantically licking his a**e like Boris Johnson does. And people like Jeremy Hunt meeting Kissinger. Dimmack praises Corbyn for calling Trump out on moving away from the Paris accords, scrapping the nuclear deal with Iran and moving the embassy to Jerusalem and states that you won’t find Tweezer doing the same. He predicts that in the Tory conference the following week we’ll get Tweezer offering Trump an olive branch in the hope of a trade deal. Dimmack also praises him for condemning the war in Yemen, and states that while he’s critical of standing ovations, this one was definitely warranted. Dimmack makes the point that this is a proxy war that the West is allowing. We could stop it at any time. The Saudi planes wouldn’t even be able to take off unless we and the Americans gave our permission. Dimmack is less impressed by Corbyn’s statement that the foreign policy would be run by Emily Thornberry. Although she’s an ally of Corbyn, she was mentioned in an article by the Electronic Intifada about the decision at the conference to freeze arms sales to Israel and other, similar countries like Saudi Arabia. Despite her closeness to Corbyn, Thornberry’s a supporter of Labour Friends of Israel and opposed the decision. The party also condemned the killing of civilians by the Israelis on the ‘March for Freedom’ protest. Dimmack would like to know who the source for the Intifada’s article was, as they are not named. Dimmack states that Corbyn’s pledge that Britain would no longer engage in interventionist wars is what we all wanted him to say. He makes the point that Libya was ‘liberated’ in 2012, and that now there is a slave trade there. An open air slave trade in the markets. He goes on to say that this is ironic, as Reagan’s chief of staff for the CIA, Bill Casey, was under investigation at the time Reagan held his first meeting with him and the other chiefs, because he was suspected of instigating a coup in Libya to oust Colonel Gaddafy. One of the lies the Agency was spreading to destabilise Gaddafy’s regime was that Gaddafy was involved in a slave trade with Myanmar. And then after they get rid of Gaddafy within a few years there is an open slave trade in Libya. Dimmack approves of Corbyn substituting negotiation for aggressive action, as you can’t solve anything without lines of communication, and the way he attacked Israel and the Saudis without explicitly singling them out. He goes on to state that the newspapers, especially online, were unanimous in their acclaim of Corbyn’s speech. Even the Torygraph, which said it was his best speech yet. Dimmack says that with this going on, it’s no wonder that within 90 minutes to a couple of hours following it that the government leaked details that one of the two men accused of poisoning the Skripals was commended or given a medal by Putin. He leaves his audience to make up their own minds about it. Dimmack states that while there are some things he doesn’t like about the speech, it’s what he wanted to hear, and it’s a radical shift in our country’s foreign policy. And when people hear Corbyn speak, he wins votes. Unlike the opposition, who, like the Democrats and Hillary, don’t want Tweezer to campaign as whenever she does, her approval rating goes down. He then predicts that Tweezer at the Tory conference in the next few days would have a more difficult time than Jezze did. In this video from RT America of just over eight minutes in length, posted in 2015, Priya Reddy, one of the broadcaster’s own producers, talks to the news anchor about Max Blumenthal and his book, Ruin and Resistance in Gaza: The 21 Day War. Blumenthal had been speaking about the book at an event the previous evening, which Reddy had attended and interviewed him. Reddy begins by describing how well attended the event was, and how many Jewish people were there, talking and being very critical of Israel. Blumenthal made it very clear that Judaism and Zionism are not the same thing, not every Jew identifies as a Zionist, and that there’s a whole new generation of young Jewish people, who are very critical of Israel. The news anchor asks her how she would compare Blumenthal’s approach to that of the general US media. Reddy states that what she respects about Blumenthal’s work is that, rather than doing Israel’s PR, he went to Gaza, interviewed the victims and extensively documented some of the most horrific war crimes in modern history. Which is what a real journalist does. Blumenthal stated that the standard US media coverage of Gaza was simply to take talking points from Netanyahu’s right-wing government and repeating them. This is followed by a clip of Blumenthal saying that he wanted to honour the resistance of the Gaza strip by telling their own stories and presenting their testimonies in their own words. And most importantly he wanted to identify and expose the criminals, who devastated Gaza, who killed over 2,200 people, including 550 children. Blumenthal described the incident when the Israeli navy fired on small Palestinian boys playing soccer, the kids were aged 9 to 11 years old. Israel routinely targets children, but what was different this time is that it occurred right in front of an hotel where foreign journalists were staying, and so they couldn’t ignore it, and it was reported with more accuracy than the rest of the war. There’s then another clip of Blumenthal, in which he says that there’s still a fear here in DC among the media and political elites, among the influential people in Washington of taking on Israel as it is, as an apartheid state that doesn’t want peace, which intends to occupy permanently Palestinian land and hold Gaza under siege. To do that is just a bridge to far, not because people don’t realise that here. They realise it. You could see at his talk people knew something was wrong and it was resonating. But there is a pressure machine, there is a lobby that can still destroy your political career. For Blumenthal personally, he was able to do it because he’s an independent journalist, and he really has nothing to lose by telling the truth. Reddy goes on to state that Blumenthal’s book exposes some of these extremely horrific war crimes. There’s a long-standing pattern in the US media of downplaying these crimes, which has been extensively documented by groups like Fairness and Accuracy In Reporting and many others. She also states that it was interesting to learn from Blumenthal that Sheldon Adelson and Haim Habad – who supports Hillary Clinton – actually discussed buying the New York Times and LA Times outright. Controlling the narrative is a top priority for the Israel lobby. Israel has not only banned journalists from covering Gaza, but has actually bombed media buildings and shot and fatally killed a number of journalists. The news anchor continues, saying that Sheldon Adelson is a big heavyweight when it comes to buying, or as they would put it, contributing or donating to campaigns, typically to the Republicans. Reddy then interrupts, saying the buy both Republicans and Democrats. The news anchor then goes on to describe a recent incident where Israeli settlers set fire to a Palestinian home, burning the family alive, killing an 18-month old baby. Reddy had asked Blumenthal, who he thought was responsible for inciting that kind of violence. Reddy replies that it is not unusual for settlers to target Palestinians, and there is almost never any legal penalties, which sends the message that it’s no big deal if you murder a Palestinian. Reddy says she asked Blumenthal specifically about inflammatory statements made by top level officials, like Netanyahu, Eilet Shaked that not only sanction but encourage this type of barbaric behaviour. This is followed by a clip of Blumenthal stating that incitement to genocide and incitement to killing children is legitimate when it’s inciting the citizens of Israel to do it in army uniform, and that’s what Eilet Shaked did when she called for the killing of mothers in the Gaza strip, their extermination in order to prevent them giving birth, in her words, to ‘little snakes’. This was the Justice Minister, the person in charge of the court system. Moshe Alon, the Defence Minister, recently pledged to hurt children in airstrikes in Lebanon, in April 2015. That was considered legitimate. What is not considered legitimate is a fanatical settler like Moshe Orbach, who wrote a manual, which isn’t even in wide-publication, for burning Palestinians alive in their homes. He wasn’t calling for that in army uniform, he called for it in vigilante fashion and so was pulled in for interrogation. So the state, which has killed 550 children, many of whom were burned alive, uses the settlers as moral cover for its own crimes. The news anchor says that this is a difficult situation, and many people will be asking what they can do to change it. Reddy says that there is international law, but there is a massive failure of international institutions to hold Israel accountable, such as the UN or the ICC, that’s why grassroots movements are so important and individual actions are so important. Blumenthal talked about the Boycott, Divestment and Sanctions movement. Reddy therefore asked him why the BDS movement, which is explicitly anti-racist and pro-human rights, is so aggressively attacked by well-funded Israel lobbyists as anti-Semitic. There’s then a clip of Blumenthal saying that it’s the same thing people hear from White supremacists here in the US: that when African-Americans talk about racism, they’re being racist, or when they talk about White violence against African-Americans, racially inspired violence, they’re being racist. It’s the language we hear from Zionists when they complain that the BDS movement is a movement of hatred, when all they’re doing is supporting international law. Meanwhile, across the North Sea, Trump’s ambassador to Germany, Richard Grenell, has managed to make himself extremely unpopular to the point where some left-wing German MPs are calling on Angela Merkel to throw him out of the country. Grenell had already upset the Germans by telling them that as Trump was going to impose sanctions on Iran, they should wind up their business connections with the country. He has now further enraged them by giving an interview to the extreme right-wing news agency, Breitbart, in which he said that he wanted to empower right-wing movements across Europe, as he thought there was a Conservative resurgence going on. In this video from RT, Peter Oliver reports on the reactions to Grenell and his remarks in Germany. Martin Schulze of the SPD, the German equivalent of the Labour party, caustically remarked that ambassadors are representatives of states, not political parties. He then accused Grenell as acting less like a diplomat and more like ‘a Far Right colonial officer’, and demanded his expulsion. Andrej Hunko, of the Left Party, also explains why Grenell’s comments are illegal under international law, quoting the regulations chapter and verse which specifically exclude diplomatic staff from engaging in party political activism. The video also includes comments from the German public. These range from ‘I’m not really bothered about it, but he should be more diplomatic’ to one gent, who is really outraged about it, and goes on at length about how disgraceful it is. Fuelling this outrage at Grenell’s stupid and undiplomatic comments are concerns about the rise of the AfD, the far-right, anti-immigrant, Islamophobic party that has just entered the Bundestag for the first time. They are deeply unpleasant, and contain real Nazis and Holocaust-deniers, who have denounced the Holocaust monuments in Germany. One of their leaders even said in a speech that he’d build an underground railway to Auschwitz, which seems a very clear statement to me that he fully supported the Nazi extermination of the Jews. The last thing Germany or any other country needs is for Trump to encourage the AfD and parties like it. This is one of the classics of the graphic novel. Joe Sacco is an American journalist. He spent two months with the Palestinians in late 1991 and early 1992 in Gaza and the West Bank during the time of the first Intifada. He wrote and drew Palestine after his return to the US, basing it on his notes, publishing it as a nine-part comic strip. These were later collected into a single volume to form the graphic novel. The book also has a kind of introduction, ‘Homage to Joe Sacco’, from Edward Said, the author of Orientalism, critic of western imperialism and attitudes to the Arabs, and himself a Palestinian. This is precisely the type of book the Israel lobby does not want people to read. Not BICOM, not the Campaign Against Anti-Semitism, which was set up because Gideon Falter, its founder, was worried about British attitudes becoming more hostile to Israel after the blockade of Gaza, not the Jewish Labour Movement, formerly Paole Zion and the companion party to the Israeli Labor Party, not the various ‘Friends of Israel’ societies in the political parties, Tories and Labour, nor the Jewish Leadership Council and definitely not the Board of Deputies of British Jews. All of them shout ‘anti-Semitism’ at anyone who dares to publish anything critical of Israel, or show the barbarity with which it treats the Palestinians. The book shows Sacco’s experiences as he goes around Israel, the West Bank and Gaza, talking to both Palestinians and Israelis, meeting them, entering their homes, and listening to their stories. He starts the book in Cairo, the beginning of his journey to Israel, and to which he returns at his departure. During his time there, he visits the Vale of Kidron, the Arab quarter of Old Jerusalem, Hebron, Ramallah, Jabalia refugee camp in the Gaza strip, as it then was, Balata, another refugee camp on the West Bank, Nablus, the town of Gaza itself, and finally Tel Aviv. ‘Zionism, be it right or wrong, good or bad, is rooted in age-long tradition, in present needs, in future hopes, of far profounder import than the desire and prejudices of 700,000 Arabs who now inhabit this ancient land. We do not propose even to go through the form of consulting the wishes of the inhabitants’. Ben Gurion thought it would be simple to expel the Palestinians, because he felt they had no real attachment to their homeland. He wrote that the Palestinian ‘is equally at ease whether in Jordan, Lebanon or a variety of other places’. With the approach of war, he made it clear their expulsion was going to be through military force: ‘In each attack a decisive blow should be struck, resulting in the destruction of homes and the expulsion of the population.’ When that was done, ‘Palestinian Arabs have only one role – to flee’. He also quotes Golda Meir, who stated that a Palestinian people, defining itself as a Palestinian people, did not exist, and ‘we came and threw them out and took their country away from them. They do not exist’. 400 Palestinian villages were razed in the war marking the birth of Israel. Meir’s lie – that the Palestinians don’t exist as a people – is still repeated by Republican and pro-Israel bloggers. Golda Meir was also concerned about the Palestinian population outstripping that of the Israelis, another issue that is still very alive today. His hosts are polite, welcoming him into their homes, and plying him with tea. But occasionally there is an outburst from one of them, when he’s asked what the point of him being there, of them talking to him, is. Because other journalists have been there too, and they’ve talked to them, and nothing has happened, nothing has changed. They also talk to him about the other factions, and of the peace process. In a separate text at the beginning of the book, he states that, while the peace process set up the Palestinian authority and gave them a government, it changed nothing for ordinary Palestinians, and the occupation and theft of land by the Israelis still goes on. He also reveals that the Israelis appropriate 2/3 of the land in the West Bank for their own us, which includes the establishment of Israeli settlements, which are illegal under international law. And the governments gives Israelis plenty of incentives to move to them. They’re given a government grant if they do, lower interest rates on loan, the housing itself is cheaper than in Israel, and an income tax rate of 7 per cent. The settlers themselves can be extremely aggressive. Sacco’s hosts tell them about incidents where settlers have come into Palestinian villages, smashing windows and demanding that the owners come out. Of people shot by them, and the trivial sentences given to the settlers guilty of this. They’re given jail sentences of a few months. If they’re convicted in the first place. Palestinians who shoot and kill Israelis are jailed for years. Some lavish homes do exist in Palestine, occupied by Arabs, but most live in very bare houses, often with leaking roofs, which are vulnerable to storms. His cartoons show what his Palestinian hosts tell him it’s like in prison camps like Ansar III, with crowds of prisoners crammed into small, bare rooms with no heat and poor ventilation. There are also few eating utensils, to the various political factions in the camp – Fateh, Hamas, Popular Front, organise meal times so that everyone gets a turn with the cup and plate to eat and drink. Several of the people he talks to were arrested simply on suspicion. Israeli law allowed them to be held without charge while evidence was compiled, with his captors returning to court over and over again to request a few more days more, until the judge finally listens to their lawyer, has the procedure stopped and the prisoner released. He also shows how the prisoners were tortured through beatings, being forced to stand for hours with bags over their heads, a process permitted under Israel law. A judge ruled that torture could not be used, but what methods were to replace them were kept secret. So many Palestinians have been incarcerated, that a green identity card showing a man has been in jail is a matter of pride. And not to have been to prison correspondingly is a mark of shame. He talks about how the Israelis have a deliberate policy of not allowing the Palestinians to industrialise, so that they compete with the Israel. The State has also put obstacles in place to prevent Palestinian farmers competing with Israelis. They also deliberately uproot the olive trees many Palestinians grow to support themselves. The Israelis also appropriate most of the water, and dig deeper wells, so that the Palestinians have a much poorer water supply and their own wells are becoming increasingly saline. As a result, unemployment in Gaza was at 40 per cent. And Sacco himself was approached several times by Palestinians, hoping he could do something so that they could leave and go abroad to study or find work. He describes a school, without electricity, as well as a school for the deaf, which is supported through volunteers and whose staff complain of their lack of training for dealing with people with disabilities. He also hears and illustrates the story of one Palestinian woman, whose son was shot by Israeli soldiers, but was prevented from taking him directly to hospital. Instead she was ordered to go hither and thither, where she was told a helicopter was waiting to take her and the boy. When she gets there, there is no helicopter. She eventually takes him to the hospital herself in a car, by which time it’s too late and the lad dies. The book also shows the mass of roadblocks and the permit system which Palestinians have to go through to go to Israel. At the same time, Israelis are simply allowed to whiz through in their separate lanes. Sacco also doesn’t shy away from showing the negative side of Palestine – the anti-Semitism, and particularly infamous murders, like the killing of Klinghoffer aboard the Achille Lauro, and the massacre of the Israeli Olympic team by the terrorist group Black September. This can turn into support for the murder of Israeli civilians. There’s also a chapter on the plight of Palestinian women, This is a society where women are still very much treated as inferiors and subordinates, where honour killings are carried out as the punishment for female adultery. It is also a society where collaborators are murdered, and those, who belong to the wrong faction may also be shot and killed. The book was written 27 years ago, but nothing really seems to have changed since then. The illegal settlements are still there and expanding. Settlers are still seizing Palestinian homes and property, the apartheid separating Israelis from Palestinians is still in place, unemployment is still high, and Palestinians are still being treated as foreigners, refugees and second-class citizens on their own land. However, some attitudes are changing. The Israeli liberals Sacco talks to only support the Palestinians up to a point. When pressed, some of them will say that Israel should keep the Occupied Territories, because they seized them in war. Or that they need to keep them for security reasons. But an increasing number of young Jews in America and elsewhere are appalled at the continuing maltreatment of the Palestinians and are becoming increasingly critical and hostile to Israel because of this. And there have also grown up major opposition groups like the human rights organisation B’Tselem and Breaking the Silence in Israel. The Israeli state and its lobby and supporters in this country and others are increasingly scared. It’s why they’re trying to pass laws to criminalise the Boycott, Divestment and Sanctions movement in America, and to outlaw criticism of Israel in this country through tortuous definitions of anti-Semitism that are stretched to include it. It’s why they’re smearing, with the connivance of the right-wing media, the Blairites in the Labour party, and the Conservatives, decent people, who have fought racism and anti-Semitism, as anti-Semites. Very long, detailed books have been written about Israel’s brutal treatment, dispossession and ethnic cleansing of the Palestinians. 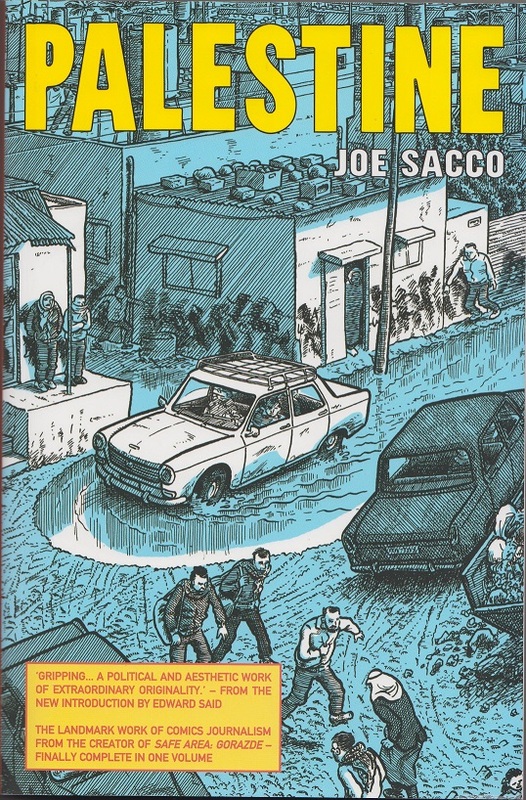 Sacco’s Palestine presenting this as graphic novel, is an example of how comics can also be serious literature, tackling a difficult subject with both narrative and artistic skill and style. I’ve mentioned on this blog before the alternative comics that were also published from the ’60s to the 1980s/1990s on political topics, including the Israeli maltreatment of Palestinians in Pat Mills’ Crisis. Palestine is very much in that tradition, and in 1996 won the American Book Award. Yesterday I put up a 25 minute video by the stand-up comedian, Richard Coughlan, debunking Holocaust denial. It’s a grim video, complete with images of the emaciated victims of the Shoah and the bodies packed into mass graves. It is, however, necessary with the Alt Right and the other Nazis trying to claw their way into power, and Coughlan did a very good job of it. This video’s somewhat longer at half an hour. In it, Coughlan talks about how glad he is that his first video was so well received, and describes the immense amount of research he did to make it. He compares learning about the Holocaust to tugging at a loose piece of thread in your jumper – it looks tiny, but once you pull much more comes away. He says he spent many months preparing the video, to the point where it felt that he spent his whole life making it. He read extensively, the first couple of books were The Boy in the Striped Pyjamas and The Man Who Broke Into Auschwitz. The latter book was the true memoirs of a British soldier, who escaped from a P.O.W. camp. The escapee heard about the death camps, and in order to investigate the truth of what he’d heard actually broke out into the most notorious – Auschwitz. His book was covered on British breakfast television about a year or so ago when it was first published. Not only did he break into Auschwitz, exchanging clothes with a Jewish prisoner, but he did it twice. Coughlan also goes on to talk about how he got the transcripts of the trial between Deborah Lipstadt and David Irving. Irving’s an extreme right-wing historian, who wrote at least one book minimizing the scale of the atrocity. Lipstadt’s an American academic, who called Irving what he was: a Holocaust denier. So he sued her, and lost. Coughlan says that by that point, Irving was losing popularity and credibility. Even so, I can remember the immense controversy that was caused when the Oxford Union invited him to speak. I can also remember talking to a co-worker at the Empire and Commonwealth Museum in Bristol, who had been in the public gallery watching the proceedings of the trial. He states that during the proceedings Irving himself was extremely confident and ebullient compared to some of the witnesses testifying against him. Not that it did Irving any good whatsoever. The trial exposed just how sloppy and fraudulent his own work on the Holocaust was. There were vital facts he didn’t mention, and he mistranslated some texts from the German. The trial resulted in Lipstadt being acquitted, and Irving’s reputation as an historian in tatters. I don’t think he’s ever recovered, and the last thing I heard the Austrians had sent him down in their country for Holocaust denial, which is a crime there and in Germany. He also talks about one text he also read online. This was an encyclopedia of the death camps, also 45,000 or so of them. The book is divided into two volumes, each volume further divided into two parts. Each part is about 900 pages. And that’s just only some of the books he read. He also talks about the monstrous horrors the Nazis perpetrated, such as the amount of ash generated by the cremation of the victims’ bodies, and the rooms full of the victims’ belongings and clothes. One room was full of children’s shoes. The victims’ were shaved, and their hair collected. In one camp, it was found stuffed into packs, so that there was a roomful of it, the total weighing many kilos. He wonders at the mindset of the guards, who could walk past these rooms full of their victims’ remains with complete indifference. He also talks about how the people, who perpetrated this atrocity weren’t any different from us, citing once again the Stanford prison experiment. This was a psychological experiment, in which people were asked to play at being cops. After three days it was called off because these ordinary Americans were actually too brutal. Coughlan says that there have been three movies made of it. There was also a documentary about it shown on British television, which repeated the experiment. However, the documentary also added a few facts that I had never heard of. Such as when the experiment began, the volunteers playing the cops actually were too lenient, and those playing at the prisoners were more or less running amuck. So the experiment was stopped, and they were more or less encouraged by the experimenters to adopt a tougher approach. And the psychology of some of high level officers responsible for implementing the Final Solution is bizarre. Joachim C. Fest in his book, The Face of the Third Reich, which is a collection of potted biographies of the leading Nazis, includes Hoess, the commandant at Auschwitz. Hoess is a vile character, who oversaw the mass murder of millions of innocents without any scruple. But he claimed he was no sadist. He said he was always at the back of the crowd, or tried to be away from it in his office, when the guards were beating or setting the dogs on the inmates. The Italian writer and chemist, Primo Levi, who had been imprisoned in the death camps, states that the guards ‘had our faces’. In other words, they were no different than we are. Coughlan says that Stamford Prison Experiment and the Holocaust shows how easy it is to turn ordinary people into monsters. And they do it gradually, drawing you into it little by little, until it all seems completely natural. Coughlan highly recommends that his viewers take an interest in the subject, and do their own reading and research, ”cause it’s good to know stuff.’ Especially if you’re confronted by someone – and here he goes into a lengthy piece of invective to describe that kind of person- who tries to tell you that it didn’t happen, or that six million didn’t really die. At one point he mocks those, who try to argue for a lower number of deaths, such as two million, asking rhetorically what makes them think this will impress anyone. It’s still an horrific number. He also says that studying the Holocaust teaches you so much, about politics, the media, how hate can be generated and used, and so on. He jokes about the old anti-Semitic remark about the media being full of Jews, who control it. Well, if that were to happen to him or people like him, he would definitely make sure his people would go into the media to stop it ever happening again. He also rebuts the objection to studying the Holocaust because there have been so many others. ‘No, not like the Holocaust’. Actually, the unique nature of the Holocaust is a problem for historians and scholars of international law and politics. There are a number of different definitions of genocide. These can differ significantly, so that some cover certain forms of persecution to the exclusion of the others. The only thing they have in common is that they all cover the Holocaust. This means that some scholars advocate abandoning the quest to produce exact definitions of genocide in order to try to prevent the violent persecution of different groups at the societal level and prosecute those responsible as they really are and occur, unencumbered by too much ideological baggage. What also comes out of this video is the sheer brazenness of the Holocaust deniers in seeking to refute what has been so extensively documented and witnessed. I’ve already mentioned how one judge in California ruled against one of the Nazi rags in his state that there was just so much supporting evidence for the Holocaust that it could not be reasonably regarded as anything other than a fact. Way back in the 1990s, when there were concerns about racist attacks in Bristol and the BNP nationally was trying to revive itself, one of the Black groups in the city held an evening, where the speaker was a Holocaust survivor, to hear his testimony about the reality of Nazism. They’re about, but obviously there are few of them because of old age, and the sheer, horrific efficiency with which the Nazis set about their extermination. Coughlan describes how Holocaust deniers and Nazi apologists try to discredit descriptions and accounts of the death camps, by focusing on small discrepancies between them. Like in one account, it says there were 12 steps down to the gas chambers, but others say there are only eleven. They then move from this to the conclusion that this shows that people were making it all up. As if it followed from what had just been said. He also at one point describes how long it took for the victims to die when they were gassed with Zyklon B: 20 minutes. It’s another horrifying detail, and Coughlan appears quite naturally deeply moved by the fact. This is a great video adding more information to his original piece. He also encourages others to learn as much about it as possible, so that they have all the information available to them to refute the lies of those who deny it ever happened, when they meet them, information which he couldn’t really put into the video here.